Pachisi is called the national game of India, and is usually played on a cross-shaped (cruciform) game board made of decorated cloth. In that tradition, this no-sew craft project shows you how to use felt to make a pachisi game board. The game board has four arms, each with 3 x 8 (24) squares arranged checkerboard-style, which join at a central square called the char-koni (throne). Pachisi, which translates to "twenty-five," is a type of circle-and-cross race game that originated in India. Included at the end of the project are rules for playing the game of pachisi and some history of the game. Easy option: Printable patterns are included for making simple print, cut, and play game boards. Bonus game: Make a simple paper game board for Asi Keliya, a circle-and-cross race game from Sri Lanka (Ceylon), also known as the shell game. The rules for playing Asi Keliya are at the end of the project. 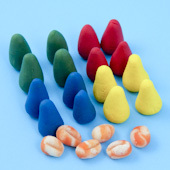 Related craft: Use Homemade Modeling Dough to make your own game pieces and cowrie-shell dice. 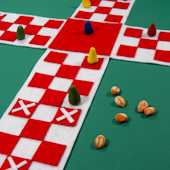 The background of the game board is made with the white felt; the adhesive-backed felt is used to create a checkerboard pattern of spaces on the arms, and the center square. 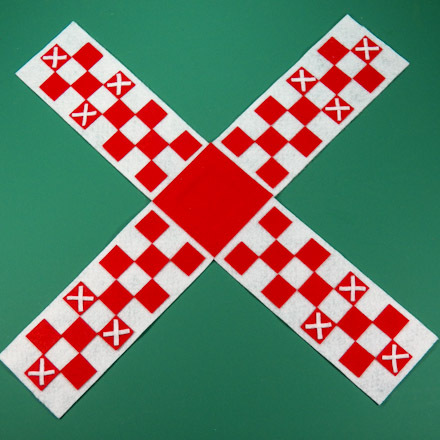 From the white felt, cut four rectangular pieces that measure 3½" x 9"—these are the arms of the game board. Also cut twenty-four 1" x 1/8" strips from the white for the "X" spaces. From the adhesive backed felt, cut forty-eight 1" squares and two 3½" squares. Tip: Each arm of the game board requires twelve 1" squares. Cut the squares for each arm in a different color of felt for a colorful game board. Easy Game Board: Use these printable patterns to make simple print, cut, and play game boards for pachisi and Asi Keliya. Just follow the instructions in the English Board Solitaire craft project for making a paper or cardstock game board. There's a set of 16 playing pieces at the bottom of the pattern. Cut them apart and fold them like the racing car game pieces in the Racetrack Board Game project. Without removing the backing, arrange 12 tiles in a checkerboard on one white arm. Place the tiles so there is a ¼" white border along the sides and at one end. Start at one end by placing a single 1" tile ¼" from the end, centered. Place seven more rows of 1" tiles in alternating rows of two and one to form a checkerboard on the white background. When you are satisfied with the checkerboard arrangement, carefully remove the backing from each tile, one by one, and press in place. Repeat for the three arms. Tip: Laying a ruler along one side of the arm, overlapping the edge by ¼", will make placing the tiles in a even line easier. A clear ruler with ¼" rules works very well as a guide. The four arms meet in the center and are held in place by the large red felt squares. Use a pencil and ruler to mark a line ½" in from the top end of each arm (the end with the wider white border). Cutting from the marked line toward the top, snip off each corner of the top end at a 45° angle. Arrange the four arms in a cross, abutting the snipped corners. The four marked lines should form a 3½" square; make adjustments if needed. 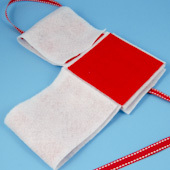 Remove the backing from one of the 3½" red squares, and carefully apply it over the abutted arms and marked square. Press firmly in place and rub to ensure a good hold. Flip the board over and apply the other 3½" red square to cover the backside of the joins. 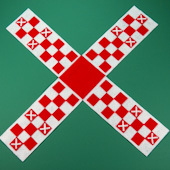 Three spaces on each arm, called castle squares, are marked with an "X". Use tacky glue or fabric glue to glue two 1" x 1/8" white strips in an "X" on the center red square at the end of each arm, and on the two red squares on the fourth row from the end on each arm. Set aside to let the glue dry. If you like, embellish the game board with felt cutouts or embroidery. Pachisi game boards are usually folded for storage. Cut a 24" length of ribbon in a coordinating color to use as a tie. Fold each arm in half, and then fold two arms over the center square and fold the other two arms back under the center square. Tie the bundle together with the ribbon in a loose bow. 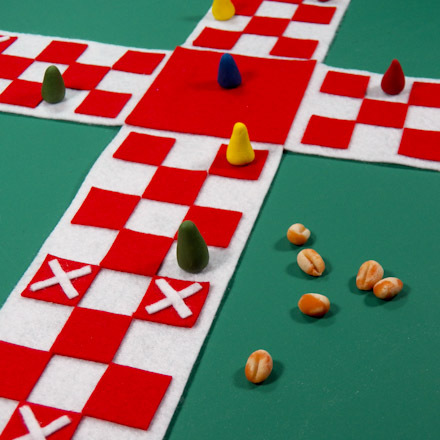 To play pachisi, you will need a game board and four sets of four playing pieces (traditional set colors are black, yellow, green and red), and six cowrie shells. 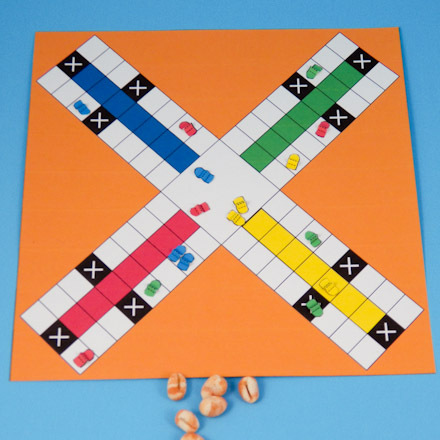 You can use playing pieces from other games, mini-marshmallows or cereal (Cheerios, Kix, Trix). Two-sided dice or coins may be used in place of the cowrie shells. 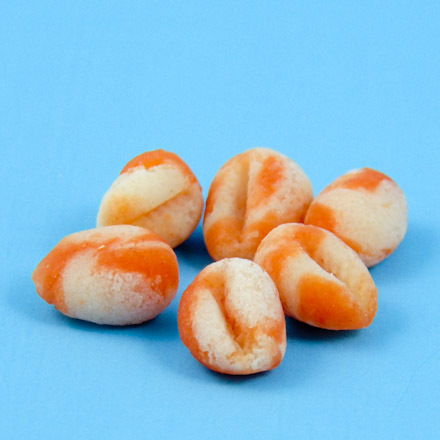 Or, you can make your own playing pieces and cowrie shells with homemade Modeling Dough. Pachisi is a game for two or three players, or four players in two teams (usually, black and yellow versus green and red). The object of the game is to be the first player (or team) to move all pieces around the board and back to the center (char-koni). Each player sits on a different side of the board. The partners sit across from each other. All of the playing pieces are placed in the center square (char-koni). To start the game, each player throws the cowrie shells. The player with the highest score starts the game. Count each up mouth as one. Two of the throws are special: one cowrie shell with mouth up scores 10 and another turn; no cowrie shells with mouths up scores 25 and another turn. Pieces move around the board in a counter-clockwise direction. They enter from the center square (char-koni), go down the "arm" (char) of the board facing the player, around the board, and back up the char to the char-koni. When pieces return to the char, they are placed on their side to show that they are on the return trip. A player's first piece may enter the board on any throw. After that, the player must throw a 6, 10, or 25 to enter a piece from the char-koni. A player can capture an opponent's piece by landing on the same square. A captured piece is returned to the char-koni, where it must start over. The capturing player gets another turn. Pieces are safe from capture on the "castle" squares. These are the 12 squares on the board marked with an "X". A player, or a team, can form blockades with two or more pieces on the same square. An opponent cannot pass a blockade. The pieces in a blockade can be moved together on a single throw. A blockade can be captured by an opponent's blockade, with the same number of pieces or more, landing on it. A single playing piece or a blockade with fewer pieces cannot capture a blockade. A blockade on a "castle" square is safe from capture. A player can refuse to move on his/her turn. Do this to avoid capture or to help your partner. A player can also take a second trip around the board in order to help his/her partner. A piece must exit from the char to the char-koni on an exact throw of the cowrie shells. Tip: Remember, in a team, both players win or lose together! It is not a good idea for one player of a team to finish way ahead of his partner. The game ends when one player (or team) moves all pieces around the board and back to the center (char-koni). Your game board is done! Have fun playing pachisi! Pachisi and Asi Keliya have similar rules of play. For Asi Keliya you will need a game board and four sets of four playing pieces (traditional set colors are black, yellow, green and red), and five cowrie shells—four yellow and one white. Asi Keliya is a game for four players in two teams (usually, black and yellow versus green and red). The object of the game is to be the first team to move all eight of their pieces off of the board. Each player sits on a different side of the board. The partners sit across from each other. All sixteen playing pieces (men) are placed in the center square. To start the game, each player throws the cowrie shells. The player with the highest score starts the game. There is a special throw called so-hatara. This is four mouths up and the white cowrie mouth down. So-hatara counts four, but can be split into four moves of one. All other throws must be used to move just one man. Pieces can enter the board on 1 or so-hatara. A player gets an extra throw with a 1, 5, or so-hatara. Pieces are entered on the center row in front of the player. Each piece races around the board and returns up the starting row to the center square. When a piece arrives back at the center square it is removed from the board. When a man reaches the middle row on its return, it can only be moved on a throw of one. A man is captured if the enemy lands on the square it occupies. The man is returned to the center and must start over. Double men are not immune from attack, but after being sent back they may reenter on the same turn. When one team has removed all eight pieces from the board, they are the winners. When and where did the game of Pachisi originate? Race games played on cruciform boards originated in India. They have spread from there to all over the world. The most popular of these games is pachisi, which translates to "twenty-five". 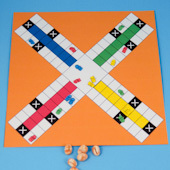 The game is played on a cross-shaped board with 3 x 8 (24) squares in each arm. The central square is called the char-koni (throne). Boards are usually made of decorated cloth. Pachisi is called the national game of India. The rules vary from one part of India to another. Pachisi originated in India during the sixth century, or even earlier. Traces of pachisi boards carved in stone are still visible at the ancient temples of Ellora in the Deccan region of India. It is traditionally played with dome-shaped playing pieces and cowrie shells. A variation of pachisi, called chausar, is played with three oblong, four-sided dice. Chausar are marked on opposite sides with 1 and 6, 2 and 5. Chinesenspiel means "game of the Chinese" in German. It is a simple children's game based on pachisi. At the time that the game originated (19th century) in Germany, Chinese things were in fashion. No one seemed to care that this was really a game of India. Asi keliya (the shell game) is played throughout Sri Lanka. It is also called sonaru ("four-four"). A race game that originated in Korea is called Nyout. It has been played for thousands of years, and it is also played in other parts of Asia. There is even some evidence that the game spread to North America from Korea. The game can be played with just about any number of players, but is most often played by four players in teams of two. Tip: The squares marked with "X" are called castle squares. Playing pieces on these squares are safe and cannot be captured by the opponent. There are three castle squares on each arm of the game board. Tip: It is easy to make playing pieces and cowrie-like shells with homemade Modeling Dough. Pachisi playing pieces are usually dome-shaped in black, green, red, and yellow, but you can make pieces in any colors you like. You will need four sets of four pieces. Make cowrie-like shells by marbling white and tan clay together, forming bean-shapes and making a "mouth" with the tip of a plastic knife or a popsicle stick. Tip: Pachisi game boards are usually folded and tied for storage. Cut a 24" length of ribbon to use as a tie. You might also make a small Rectangular Box to store the playing pieces and cowrie shells. Tip: For storage, fold the arms of the game board in half. Fold two folded arms over on top of the center square and fold the other two arms back and under the center square. 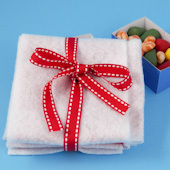 Tie the bundle loosely with the ribbon. Tip: Use one of the printable patterns to make a quick and easy paper or cardstock pachisi game board.